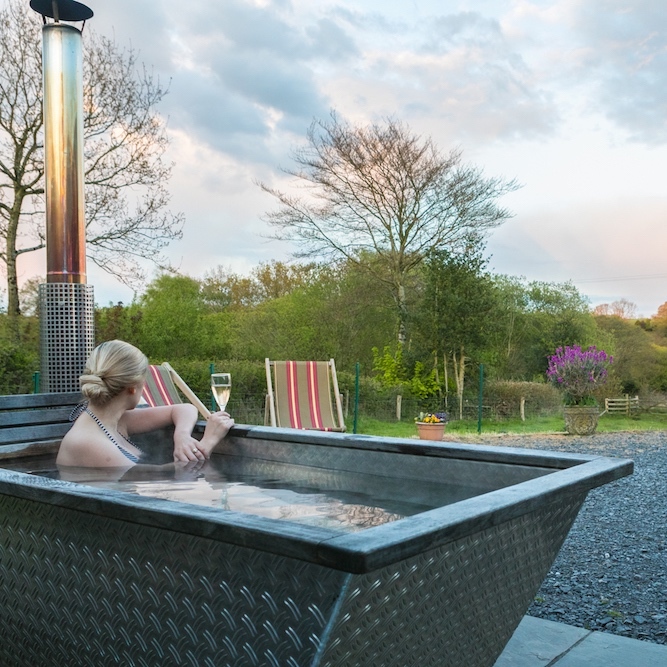 Want to commune with nature but still enjoy all the luxury of a boutique stay? 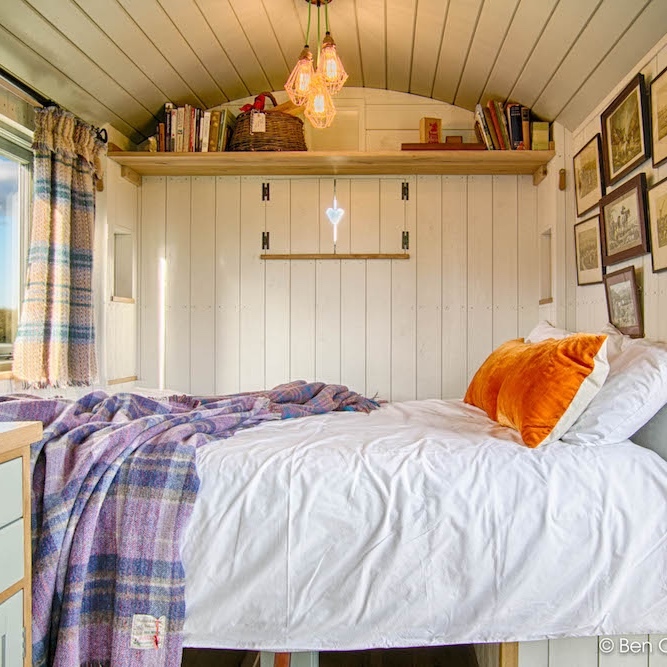 Then book yourselves into the Shepherd’s Hut at Dimpsey Glamping, pronto! 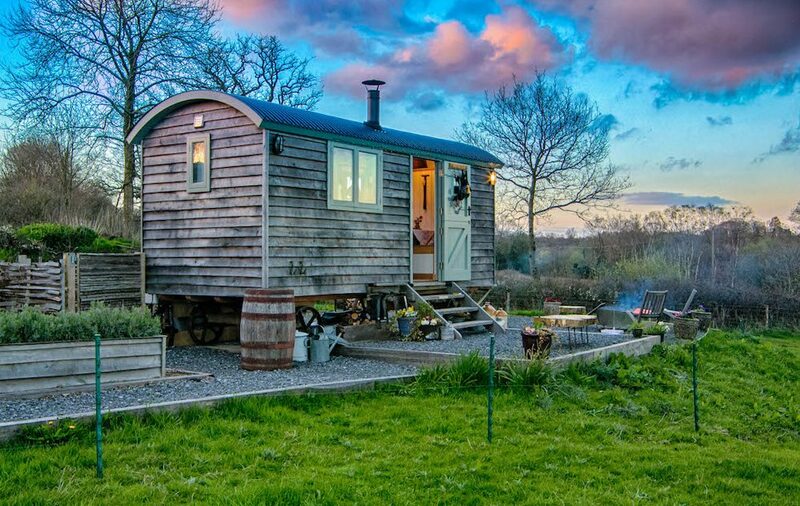 Located on a small farm (so old it’s listed in the Domesday Book) on the Blackdown Hills, an Area of Outstanding Natural Beauty on the Somerset and Devon borders, the Shepherd’s Hut is surrounded by glorious countryside – valleys, hills, ridges and plateaux – dotted with farms and villages. Owners Emma and Andrew, inspired by the Mandarin Oriental mantra ‘Luxury is achieved when service is intuitive and goes beyond obligation’, have thought of everything to make your stay – whether it’s a retreat, a couple’s romantic getaway or just a place to chill – as picture-perfect as the views. Inside, the Shepherd’s Hut is all vintage chic, with a log burner, a super comfy double bed, sheepskin-covered bench seats and table, day bed, fairy lights and a little gas hob with a slow-boiling whistling kettle (natch), all sorts of quirky old and artisan-made pieces, interesting mags, books and board games. You might be in a field but there’s no compost loo here but an en suite bathroom with shower, flushing loo and luxury bath products. 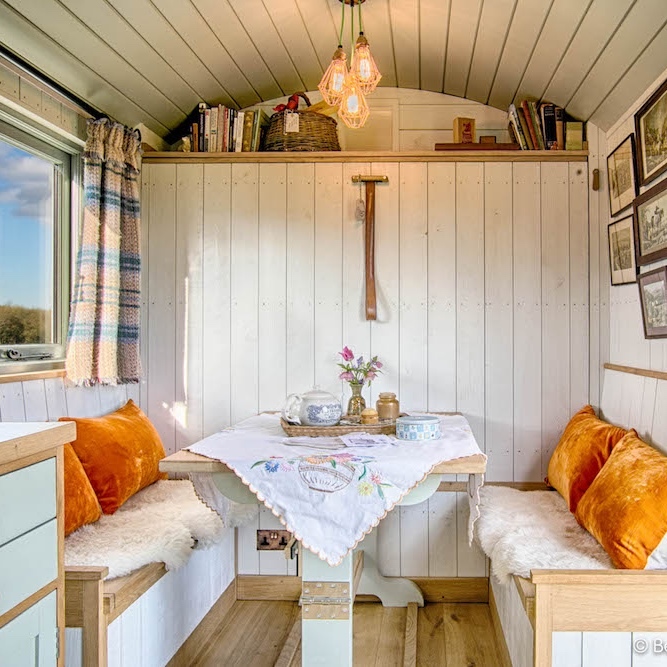 Outside, there’s a wood-fired hot tub and a garden oven as well as a fire pit for barbeques or just for snuggling up as you gaze at the stars (there’s a telescope in the Hut if you want a closer look). And there are those views. Walks, riding, golf, assorted National Trust properties and the spectacular Jurassic coast are all within easy reach – or just go for a walk with the little flask, enamel mugs, vintage picnic basket and maps provided. You can buy meat – from rare breeds like Dexter cattle, Jacob and Zwartble sheep and Tamworth pigs – and eggs from the farm. Possibly the lowest food miles your food will have ever travelled! And the name? Dimpsey comes from the West Country name for twilight or dusk, the half light at the end of the day… the perfect time for sipping that glass of fizz.